This image shows Senator Bernie Sanders (D-VT), Senator Elizabeth Warren (D-MA), and Senator Cory Booker (D-NJ). Even before they announce their White House intentions, New Hampshire's ambitious neighbors are waging a shadow campaign to shape the nation's first presidential primary election of the 2020 season. 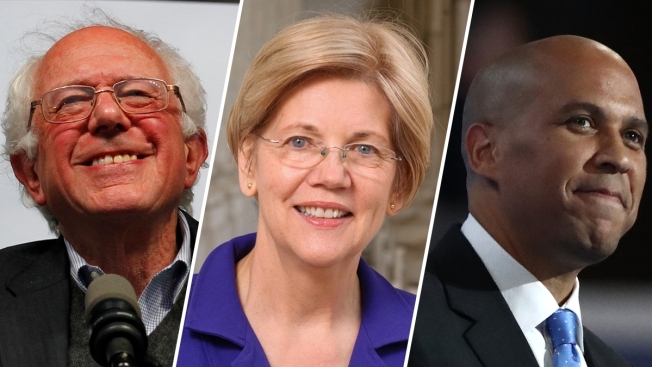 As many as five New Englanders are actively considering running for the Democratic presidential nomination, a contingent led by Vermont Sen. Bernie Sanders and Massachusetts Sen. Elizabeth Warren, who have quietly begun courting potential staff, top activists and elected officials. Meanwhile, outsiders like New Jersey Sen. Cory Booker are fighting for a foothold in the state, which will hold tremendous power in the selection of the Democratic Party's next presidential nominee. New Hampshire Democrats have raised the possibility of dueling primary contests emerging in the coming year -- one for the New Englanders and another for the rest, like Booker.